A fresh bouquet can brighten anyone's day, whether it's a special occasion or just a pleasant surprise. Online florists offering international delivery provide a quick and convenient gifting option for those with loved ones living abroad. Before you invest in a long distance flower delivery, take a closer look at the performance of some of the top companies. The Gold Award winner ranking number one at TopTenReviews is 1-800-Flowers, earning 9.95 of 10 stars. A significant factor putting this florist at the top spot is the vast selection of flowers and gifts. Excellent customer service was also noted, including a top-notch chat feature providing instant assistance with online flower deliveries and helpful representatives to answer all of your questions. International deliveries to 195 countries are handled by local florists, with same day or next day deliveries available in some areas. Note that gift and flower selections vary according to the recipient's location. ProFlowers ranks highest among online flower retailers for customer satisfaction, according to the J.D. Power 2015 Online Flower Retailer Satisfaction Report. ProFlowers performed well across seven factors used in determining satisfaction including competitive prices, a variety of merchandise options and quality customer service. ProFlowers also beat out 1-800-Flowers, FTD and Teleflora in a comparison done by the Consumer Warning Network, delivering a rose bouquet that looked as good as the one pictured online and at a lower cost than most of the competitors. ProFlowers International delivers to dozens of countries worldwide. Select your recipient's country to view the available flower arrangements and prices, which vary widely according to your chosen destination. The reviewers at Yahoo Finance put online flower delivery services to the test, comparing four of the top companies on deliveries of roses. The standout winner was Teleflora, which uses a network of local florists to guarantee delivery of professionally arranged bouquets. Teleflora was also the top pick in a comparison done by San Francisco's KCBS, with very good flower quality in a fresh and full bouquet. Teleflora delivers to dozens of international countries including Canada, Mexico, Australia, the Philippines, and Japan, and European locales such as France, Germany, Italy, Spain, Switzerland and the U.K.
FTD received the 2014 Women's Choice Award for the most recommended flower delivery service by American women. FTD has the most longevity in the industry, originally known as Florists Telegraph Delivery when it was founded in 1910. FTD also takes the silver award at TopTenReviews. FTD delivers to almost 100% of US households and to 150 countries worldwide. When a company earns over 1 million fans on Facebook, they must be doing something right. daFlores began as a flower delivery service serving a niche market to destinations in South America, offering a more affordable alternative to large international florists. Using a network of premium florists, daFlores now provides flower delivery throughout Latin America, the US and some parts of Europe and Asia. Forbes sheds light on how founder and owner Francisco Bustos has developed daFlores into a top-notch international flower delivery service. Excellent customer service and responsiveness provide a competitive edge. Serenata Flowers is an award-winning international florist from the U.K., boasting a handful of honors including the Web Users' Gold Award for best online flower shop and the 'Outstanding Product' award from the Global Business Excellence Awards. Here you will find a wide range of both UK grown and imported flowers. Serenata Flowers offers international delivery to 18 countries, including same-day delivery on some orders. All prices listed on the site are in British pounds. To check prices in US dollars, use an online currency calculator. Serenata Flowers accepts foreign Visa and Mastercard credit cards, but check with your credit card company to see if there are additional fees for international purchases before ordering. George Preston High Class Florists is based in England and headed by award-winning florist Karen Sherwin. As a former Irish Florist of the Year, Sherwin's award-winning floral designs translate into stunning arrangements for weddings, anniversaries, birthdays and other special events. Through the Interflora network, George Preston High Class Florists send flowers internationally to over 130 countries worldwide. The prices on the site are listed in British pounds. 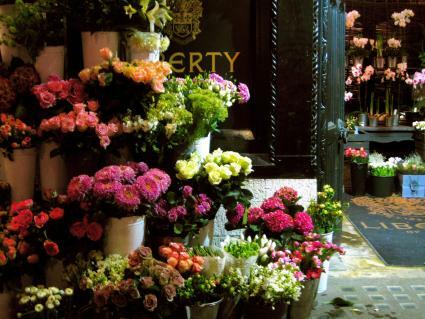 So why choose a British company over a U.S. flower delivery service? If your recipient resides in the U.K., a local florist can usually offer a bigger selection of flowers at a lower cost, especially on shipping. For example, delivery of a dozen roses to the U.K. at 1-800-Flowers starts at $119 and does not include taxes or shipping fees. The Dramatic Dozen at George Preston, including flat rate shipping of 5.99 pounds, comes to 50.98 pounds or about $73 U.S., all fees included. In addition to accepting major credit cards, George Preston accepts PayPal, where currency conversions are free.